What if, rather than throwing your grocery packaging away, you'd kept it? Your family would no doubt be cursing by now, with every spare space in your home clogged by piles of stuff, and several off-site spaces too. But what you'd also have, if you'd started early enough, is a collection of British brands and packaging second to none, and a vast pit of nostalgia in which to wallow. Robert Opie did just that, and retains them all. 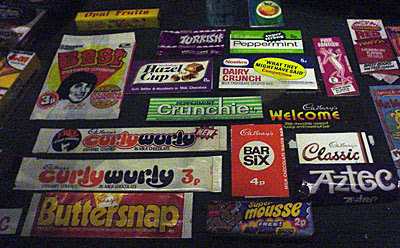 From a single Munchies chocolate wrapper kept from 1963, he's built up an extraordinary collection of branded products and promotional items which catalogue the evolution of Britain's consumer society. What's more, his collection recently outgrew its former home in Notting Hill, so has moved into larger premises round the corner in Ladbroke Grove. And with the re-launch weekend coming up, and entrance half price, Easter is the ideal time to visit. When was the last time you saw a packet of Omo washing powder, or a tin of Libby's evaporated milk, or a Pink Panther candy bar? On social media perhaps, where the conversation probably went "Do you remember...?" "Yes, I remember!" "Oh wow...!" "Hey, I used to love...". The museum's collection goes one better because it doesn't have photos, it has the real thing. What's more it has the real thing in abundance, with cabinets stocked like corner shops of the age, from Bovril to Cup-a-Soup and from Vim to Toilet Duck. Less than 5% of Robert's collection is on show, but there's still tons to see when you visit, so you'll likely stay longer than you think. And yes, before you ask, there is a packet of Spangles. The first, and largest, part of the exhibition guides you through a 'Time Tunnel' of packaging nostalgia from Victoriana to the present day. This wiggles disorientingly around the ground floor of the building, decade by decade, from the first stirrings of commercialism to the commonplace everyday. The early displays include railwayana, a splash of musical theatre and memorabilia from great exhibitions and jubilees. Royalty is a repeating theme throughout the tunnel, because big brands have always jumped on the commemorative bandwagon, be it biscuit tins, ice lolly wrappers or TV Times front covers. The early displays are a reminder of brands long since eclipsed (Rinso, Lyons Cakes and Peek Freans, for example) as well as products nobody buys any more (liniment, desiccated soup, blancmange and effervescing liver salts). Certain older products, such as Daddies sauce, Twiglets and Wrights Coal Tar soap, have proved far more resilient and are seen here in their earliest incarnation. The collection isn't simply restricted to food and drink, so for example Hungry Hippos makes a first appearance in the 1910s, and who'd not be tempted by a tabletop football game called Wibbly-Wob? Another of Robert's fascinations reveals itself in a diverse display of (very) early wireless sets, which you'll see develop later via bakelite radios to tiny transistors. Tastes change as the decades speed by (whatever happened to tins of treacle? whatever happened to Hooch? ), while packaging design has become bolder and less elaborate. Full size poster adverts help reveal the fashion foibles of the age ("Zambrene Waterproofs - the best rubberless raincoat"), while Sirdar knitting patterns also get the nod, as do cartoon ladies modelling the latest washing frocks. I'd love to show you the two holidaymakers on the front of the 1950s Ramsgate holiday brochure, in their austerity pillbox hats, but photography is banned throughout the museum. That might prove annoying, should you feel the urge to Instagram each fresh discovery you make, but instead you'll have to go "Oh wow, do you remember...?!" to yourself. Come the 50s and 60s and conspicuous consumption edges up a notch. How many Britons pushed the boat out with that packet of Jacob's Fig Rolls, and how many Saturday nights would have featured the contents of this cabinet of bottled cocktails (Babycham anyone, or a Susie Snowball?). The advent of the affordable fridge freezer brought us bold blue Birds Eye steaklets and whiting fillets, while no summer was complete without a Walls Popular Brick. 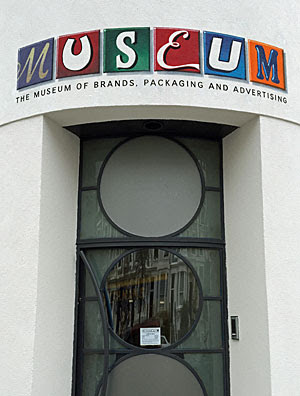 But there's still space for a selection of medicated toilet rolls, and a Lady Penelope cosmetics set ("Just like Mummy uses"), as well as a wide selection of the popular musical memorabilia of the day. As you walk around the exhibition you'll eventually reach an era which makes you exclaim "good grief, here's all the stuff I'd forgotten I used to eat!" For me it was the 1970s exhibit which transported me straight back to my childhood. I remember that packet of Chivers Jelly perfectly, and that green box of Clarnico mint creams, and how cupcakes used to be circles of sponge with a thick flat artificial layer on top. And I used to love eating Payne's Poppets, and Chef square soups, and Fry's 5 Centres, and Lucky Bags, and Bird's Eye Supermousse, and I swear we bought that very same can of Heinz New Dairy Custard. Ideally you want to be here with members of your closest family, because anything you bought back then will totally resonate. It may make you jealous that Robert has one case full of original Star Wars toys, but less so that he also has a still-boxed Jar Jar Binks. On the board game front you'll wonder why you never played Supermarket Sweep or On The Buses, but rejoice that you never manhandled Jim'll Fix It (a game for 2-4 players, age 7-adult). If you're of a certain age you'll smirk at the can of Quatro, and the Top Deck shandy, and the sugary horror that was Still Tango. But eventually the peak nostalgia moment will fade - for me that was when I reached the 1990s - perhaps because anything you bought as an adult means less than anything bought for you as a child. Robert maintains the collection right up to the present day. That means Pogs and Harvest Crunch, making way for Millennium Dome souvenirs and Golden Jubilee treats. It means an entire case of One Direction merchandise, because one day this will make your daughter bubble over, as well as collections of anything with Minions or those Frozen characters on the front of it. It means Lynx deodorant and Glade air freshener, because even the mundane deserve their place in a complete brand collection. And the timeline ends up with such modern delights as Advanced Whitening Listerine and Gluten-free Corn Flakes, because what we consume today will one day look as out of place as all those washing salts and cordials from way back. After the chronological displays comes a special section detailing the evolution of individual brands. Subtle changes are evident when you're able to view several decades of development on a single shelf. Windolene and Johnnie Walker Black Label, for example have evolved almost constantly over the past century but still retain elements of their original design. Where else could you play "spot the difference" with a row of HP sauce bottles, or Co-op 99 tea packets, or jars of Hartley's jam? But cans of Heinz beans haven't changed much, and a tin of Lyle's Golden Syrup really does look virtually identical today when compared with its original 19th century incarnation. And finally there's a big exhibition room, which doubles up as a function space, currently with cabinets arranged chronologically around the perimeter. That'll change as the museum matures, indeed they're still shuffling some of the exhibits round in readiness for this weekend's official launch. I even saw Robert himself walk by, clutching a stack of Aero chocolate bar packaging cartons, as his collection continues to increase. In a nice touch one of the items for sale in the cafe is a pack of Munchies, though I'm sure Robert bought his first pack for less than a quid. If the weather's nice you can take your tray of food and drink out into the memorial garden, this a preserved leftover from when the museum's new building was the London Lighthouse owned by the Terrence Higgins Trust. And let me reiterate, best don't come by yourself, because everyday nostalgia should always be shared.